This summer I had the opportunity to attend the HISTOR!CA Teachers’ Institute at the University of Winnipeg, July 4-10. Without equal, this was the best in-service I have attended, bar none. Of course, you should take that statement with a “grain of salt,” as I love history; thus, the chance to talk with forty history teachers was my idea of the “perfect summer vacation.” Before you think me totally weird, let me say in my own defence that my love of Canadian History has been a “voyage of discovery” since high school. 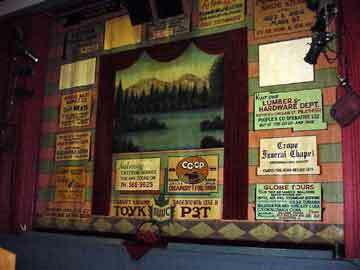 businesses that supported it in the past. To say our days were full of fun and activates would be an understatement. 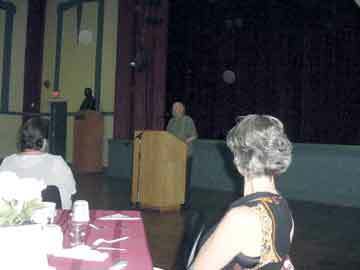 The first evening guest speaker was Peter Bjornson, Minister of Education, Citizenship and Youth. Peter spent much of his time talking about his years as a history teacher in Manitoba; very little was of a political nature. The greatest praise I heard from other teachers from across Canada was that we had a Minister of Education who was an educator. It is difficult to believe, but most ministers of education are not teachers. Our days began at about 9:00 a.m. and ended around 6:30 p.m., a long day of exposure to a great deal of knowledge. We learned about Oral History and Oral Traditions and how important they are to our history. The best way to explain Oral History is to say that it is history told by the person that lived the event, like my father telling me stories about the Depression and W. W. II, his life and perceptions of that time. Oral Traditions are stories told about other people, like those my father told me about Captain Edward James Whynot, a relative. Edward did not tell the story; my father told the story; therefore, it is an oral tradition, not a fact, not history. It may still be true, but there is just no way to prove it is the truth. My father’s perceptions of World War II do not always agree with the history texts, but that is not to say that my father did not tell the truth. It simply means his perception of events is not the same. To help explain these two concepts from the First Nations perspective we had Luc Côté, professor of History, Collège universitaire de Saint-Boniface, and Alex Freund, professor of History, University of Winnipeg. Dr. Brian Rice, Faculty of Education, University of Winnipeg, also talked about his new work entitled, “Encounters Between Newcomers and the Aboriginal Peoples in the East.” If you get a chance to pick up this book, please do so, as it is an excellent read. You can find it at the University of Winnipeg bookstore. The next day’s activities were lead by professor Nolan Reilly, Chair of the Department of History, University of Winnipeg, and Franca Iacovetta, professor, University of Toronto. These activities built on the concept that Canada was not always a nation of multiculturalism. In the past the Loyal Order of Orangemen, “one king, one flag, and one language” reflected the prevalent point of view about immigration. This concept seems foreign to us at the present time, but in the past it was common among Canadians, or at least English-Canadians. Professor Reilly informed us about the traditions of the many immigrant communities of Winnipeg’s North End, and Professor Iacovetta informed us of the contributions of the Italian community in Canada and Toronto. Italian-Canadian women were the main focus of her research as women for the most part have been left out of Canadian history. It follows then that their oral histories and oral traditions are very important to a fuller understanding of the Canadian concept. The oral histories and oral traditions of the immigrant communities of Winnipeg’s North End became the focus of the next day’s activities. We journeyed to the Ukrainian Labour Temple in Winnipeg’s North End. Above the door of this beautiful stone structure were the words “Workers of the world unite.” Being a strong “union” man, I felt right at home. Our guide for life in the North End was Myron Shatulsky, who left us spellbound as he recounted the oral traditions associated with the Winnipeg General Strike, stories handed down from father to son. He also gave us a feeling of life in the North End during his lifetime – his own oral history – as he described the different ethic communities of Winnipeg’s North End from the 1930s through to the 1990s. 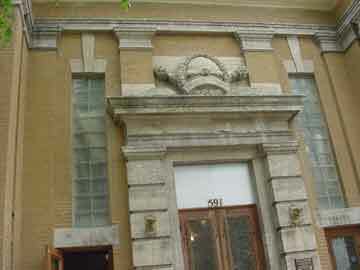 The front of the Ukrainian Labour Temple. According to Myron’s oral traditions about the Winnipeg General Strike, the strikers, whether communist or social democrats, were fighting for rights we take for granted - a fair wage for a fair day’s work, sick leave without loss of job or pay, worst of all, a time clock that told the correct time, not the company’s time, and yes bathroom breaks without loss of pay. Forty in number, we kept Myron talking for most of the day, wanting to know more and more of these oral traditions and oral history. Of course, Myron was more than happy to fulfill our every need and want. Later, he and his cohorts at the Ukrainian Labour Temple fed the entire group with a traditional Ukrainian meal. The diet went out the window! Myron Shatulsky talking to the group of teachers. After a bus ride back to the university, we worked on group projects until 6:30 p.m., then, gathered at 7:30 for dinner downtown. Thursday was an even longer day with a bus trip to Saint-Laurent to explore the Metis culture of Manitoba. Ray Millar, one of our historical guides, took us on a historical journey that highlighted the Metis hunts, the Red River Rebellion and the creation of the “Postage Stamp Province,” the transport of sand by lake barge in the 1920s for the Winnipeg glass industry, the fishing industry of the Metis community and how it has changed in the last fifty years, and finally the re-birth of the bison culture through farming rather than hunting. Besides the history of the community, we enjoyed two traditional Metis meals, and Metis music. The fiddlers and guitars played from early morning till we left in late evening. Dance went with the food and music; even I was caught in the moment and tried a traditional jig. (Be thankful you did not witness this, as I do not believe I did much for the reputation of Frontier School Division!) The most amazing thing about these people was the ease with which they changed from English to French. In mid-sentence they would change languages and back again, no thought of translation, just a normal habit. If you get a chance to explore the life of this Metis community, do so, for it will be time well spent. On Friday we met with Louis Bird, a traditional Cree storyteller and historian. As with Myron, we could not get enough of Louis’s stories. All morning we listened and hung on his every word. One story was a myth about a young man who went on a long journey. When he returned to his people, he told them fantastic stories about trees where leaves only grew on the top, and of frogs that were as large as a man and had sharp teeth. Of course the European culture dismissed this story as legend or myth. Louis Bird, on the other hand, was more inclined to believe the story was true. Could this young man have found himself in the Florida mangrove swamps with the American alligator? I do not have the answer, but it does give us room for thought. 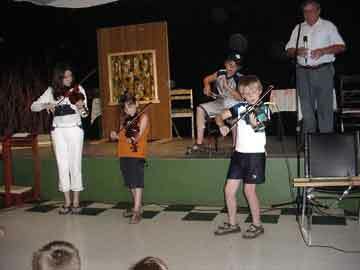 Metis music is for the whole family. 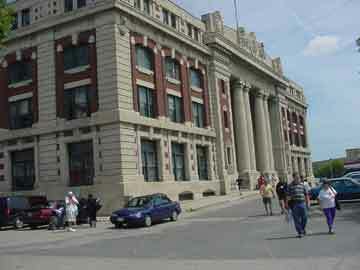 For lunch we traveled to the Aboriginal Centre, the former CPR rail station, for a traditional First Nations meal. After lunch, we explored the station and were given a lesson in early Canadian “racism” and “immigration policy” by professor Nolan Reilly. The multicultural society of Canada did not appear until after World War II and only really and truly after the laws of the Trudeau government. Previously, immigration to Canada was based on the following; English Protestants first, northern Europeans second, southern Europeans third, eastern Europeans fourth. To work the rails, the Chinese had to pay a head tax. Anyone of colour was not let in the country. After Nolan Reilly’s session the group walked to the Manitoba Museum to see what the museum could offer teachers in the classroom. After a two-hour visit and meeting the curator Sharon Reilly, we journeyed back to the university and more group work. The last presentation of the day was by Ken Osborne, a retired former instructor at the University of Manitoba. It was Mr. Osborne who answered one of my favorite questions about Manitoba history. Why did the Metis of Manitoba use the name of a German saint for their village? The answer is relatively simple. Saint Boniface was from England and went to the German lands to convert the people there to Christ. Saint-Boniface was first called Germantown after the German mercenaries that settled in the area. 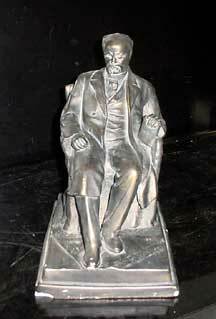 A small statue of Vladimir Lenin. believing it to be a smaller statue of Timothy Eaton. All photographs courtesy of Scott Miller.